Canon's SX280 is a good choice for anybody looking for a travel compact camera with lots of control over settings and a high zoom ratio. Its pictures have good colour and plenty of detail, and low light performance is admirable. The travel camera segment of the compact camera market is continuing to do well against a general backdrop of declining sales. These cameras can offer significantly more than the average compact camera, especially in terms of zoom capability. The Canon PowerShot SX280 HS - or Canon SX280 for short - replaces the Canon SX260. There are actually two versions of the same camera, the other being the Canon SX270 which features pretty much all of the same specifications, but lacks the inbuilt Wi-Fi and GPS of its slightly more expensive sibling. A 12.1 million pixel high-sensitivity (HS) CMOS sensor is joined by the headline feature of a 20x optical zoom lens. Starting at an equivalent (in 35mm terms) of 25mm, the Canon SX280's lens is capable of reaching a fairly impressive 500mm. ZoomPlus technology boosts that up to 40x, or 1000mm equivalent, and you can even push it further to 80x by combining ZoomPlus with the camera's digital teleconverter, giving a fairly staggering 2000mm reach. Image quality at the 80x equivalent length is likely to suffer, especially because it will be a crop of the full resolution image, but it might be handy occasionally. At its widest point, the lens's maximum aperture is f/3.5, which although isn't particularly bright compared with some of the premium cameras currently on the market, is average for a camera with such a high zoom ratio. One of the most interesting features of the Canon SX280 is that it is the first Canon camera, of any kind, to feature the latest Digic 6 processor. Canon often debuts the latest iteration of its processors in its compact cameras before distributing them among the rest of the range. With an improved processor comes the promise of improved noise performance and video recording capabilities. As such, the Canon SX280 is capable of shooting at 60fps for ultra smooth movie footage. Compared with Canon's range of IXUS cameras, the upper end of the PowerShot range generally features more advanced options, such as full manual control. The Canon SX280 includes a range of shooting modes, giving you the choice of fully automatic, semi-automatic modes (aperture priority and shutter priority) and fully manual modes. There's no capability for raw format shooting, though. Along with advanced modes, there's also a range of different modes designed to appeal to beginners, including scene modes, digital filter effect modes and the interesting Hybrid Auto mode. This basically creates a short video clip before you shoot every photo, combining all the clips at the end of each day into a Movie Digest to accompany your shots. The camera also uses the information it gathers from shooting the movie clip to determine the best settings to use for the still image. Digital filters, now found on most cameras to appeal to the Instagram crowd, include Fish-eye Effect, Toy Camera Effect and the ubiquitous Miniature Effect. The Canon SX280 joins the brand's ever expanding number of compact cameras with inbuilt Wi-Fi and GPS. The Wi-Fi functionality is designed to make sharing images quicker and easier. There's a free downloadable app for iOS and Android devices for sharing images between the camera and your smartphone or tablet. As yet, there's no remote control functionality, though. GPS offers the opportunity to geotag your images with a location, as well as create a log of your journey. 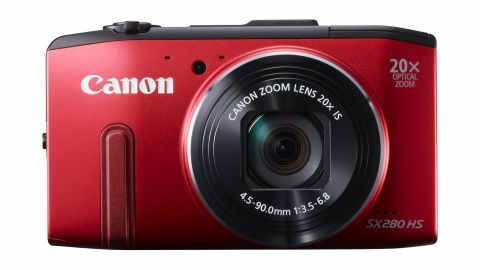 Priced at £259.99 / AU$299.95 / US$329.99, the Canon SX280 HS has a few rivals, with probably the biggest competitor being the Panasonic TZ40, which also features a 20x optical zoom lens and inbuilt Wi-Fi and GPS. The Nikon Coolpix S9500 is also a competitor, with a 22x optical zoom capability and GPS. Sony's recently announced Cyber-Shot HX50 is also a potential competitor, although this is significantly more expensive and features a 30x optical zoom.